Nevermind the enchiladas, the real treat here are the sauces. 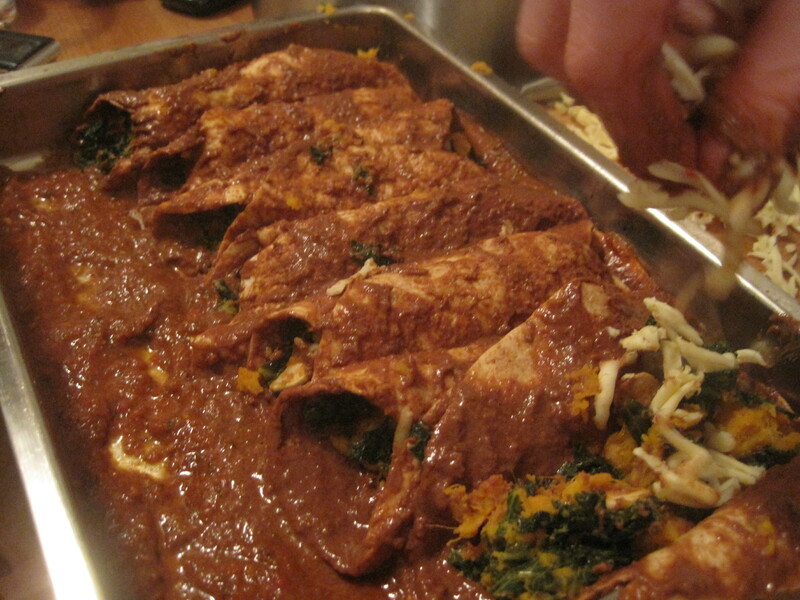 The enchiladas are served a roasted chili sauce and if you’re feeling ambitious, mole sauce. 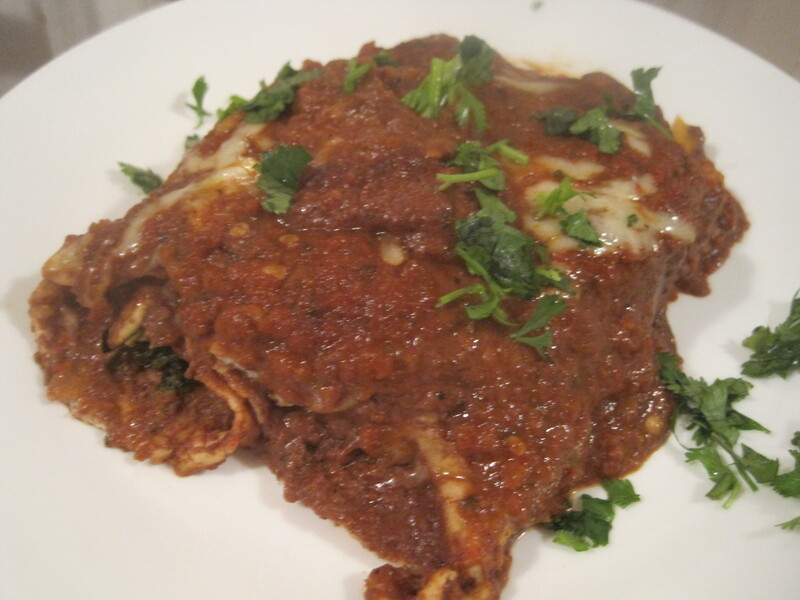 This gives you a contrast between the spicy, tomatoey red sauce and the thick, creamy and chocolatey mole. The combination of flavours is really out of this world. That being said, last time I made them, I used only mole and they were still great. Adapted from Veganomicon and made non-vegan by the addition of SO MUCH cheese. Just couldn’t say no to cheesy enchiladas. Takes quite a while to cook it all up. I’d say two hours. Heat the oil and sauté the onions until translucent. Add the tomatoes (with water, if not using canned) and bring to a boil. 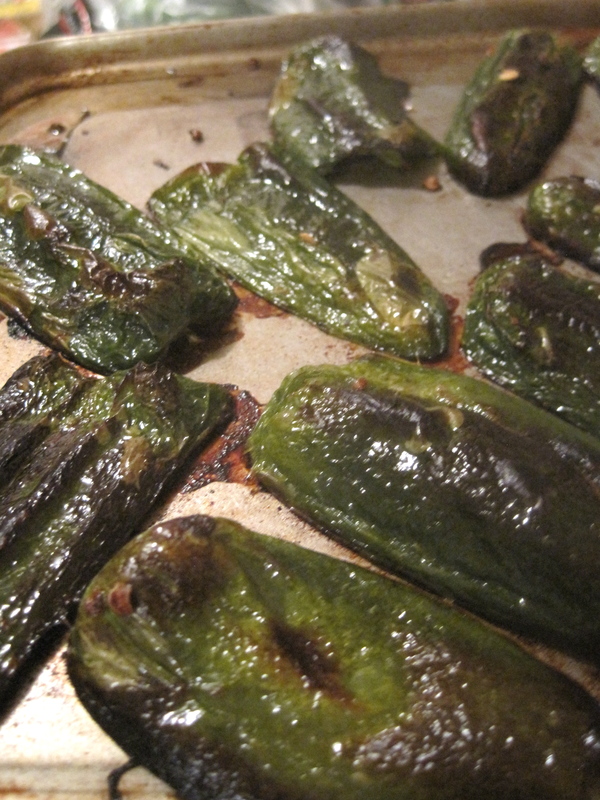 Reduce temperature, add spices and chiles and simmer for 8-10 minutes. 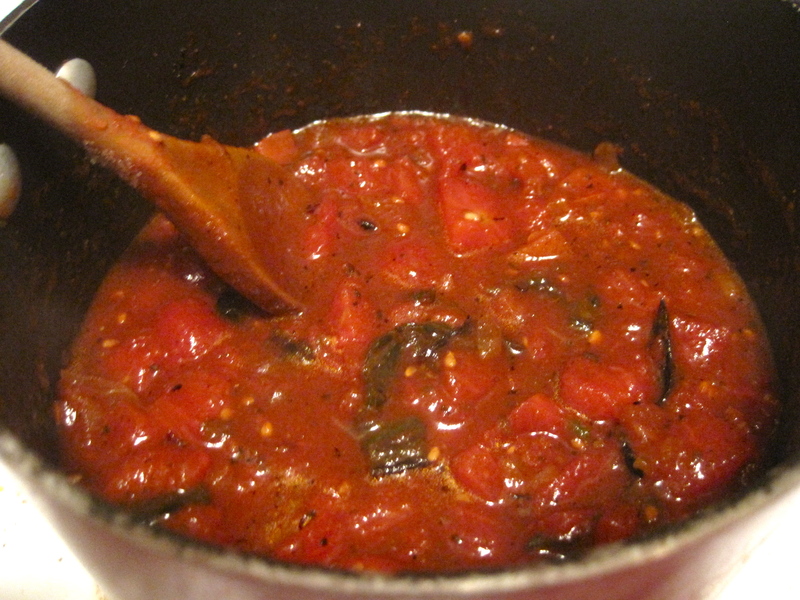 Allow the sauce to cool and pure in food processor or blender until smooth and set aside. Back to the enchiladas: Chop the kale coarsely. Drain the water from the sweet potato pot and set aside. In the same big pot, saute the garlic until slightly browned and add the kale. Sprinkle with salt, cover with a lid and steam the kale 4-6 minutes until soft. 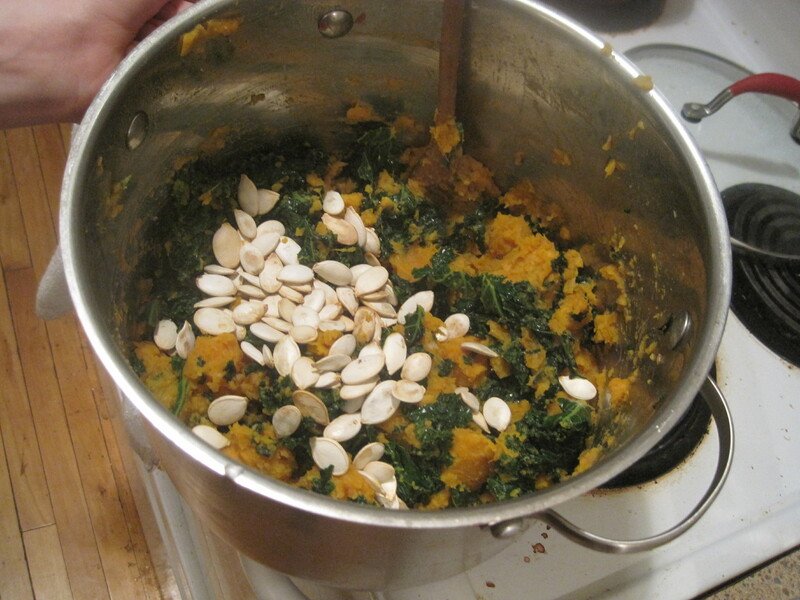 Mix in the potatoes, vegetable broth, lime juice, pumpkin seeds and salt. Cook for 3-4 minutes, using the back of a wooden spoon to mash some of the potatoes. If you made the mole, congratulations! You are now in for a fantastic meal. If you didn’t, that’s also fine. The spicy red sauce will be more than enough. This works best if you have a little assembly line going and hopefully lots of help from your friends. 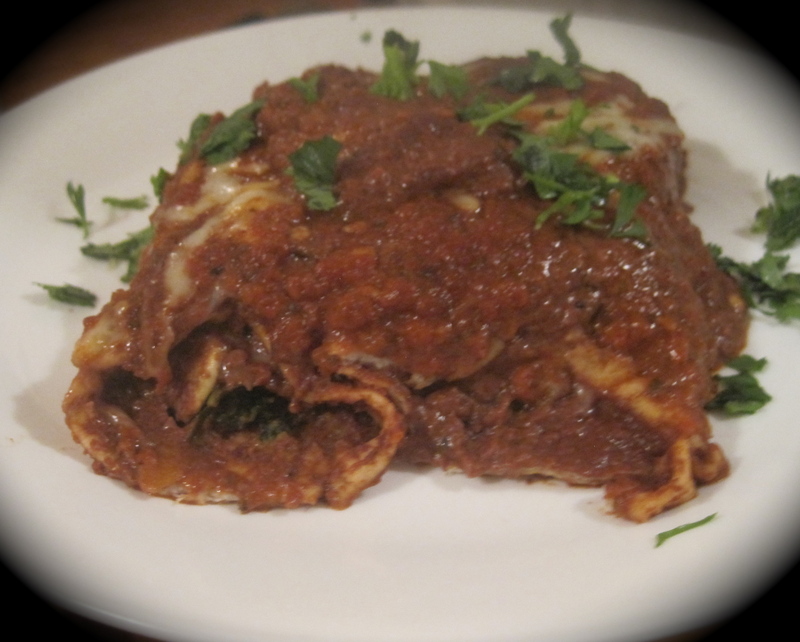 Layer the bottom of a casserole with the red sauce. Dip the tortillas in the mole, lay them down and fill with the sweet potato kale mixture and cheese. This will get messy but just carry on! Fold your enchiladas and pour more of the sauces on top. Bring to a preheated oven and bake for 30-40 minutes.